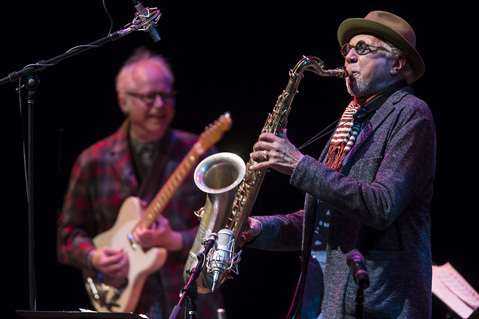 Charles Lloyd & Friends at the Lobero Theatre. As the National Endowment for the Arts acknowledged on April 20, and as the sold-out Lobero crowd affirmed on Tuesday night, longtime Montecito resident Charles Lloyd is truly an American treasure, and a “Jazz Master.” Coming home by way of San Francisco after accepting the nation’s top jazz honor at New York’s Lincoln Center, Lloyd returned to his spiritual home at the Lobero with an appropriately festive and regal band. In this “& Friends” format, Lloyd pairs two of his favorite partners, bassist Reuben Rogers and drummer Eric Harland, with a two great guitarists, Greg Leisz and Bill Frisell. The mood was celebratory from the start, with Lloyd displaying his knack for threading complex, dynamic musical ideas into the most elemental and open-hearted of riffs and melodies. Taking Frisell’s lead in their choice of material, the group explored such rich canonical texts of the great American songbook as “Shenandoah” and Bob Dylan’s “Masters of War.” Lloyd showed the same sophisticated sense of tempo and space on flute as he did on tenor sax, and his gradual elevation of mood and intensity foregrounded the edge of yearning in his unmistakably personal tone. Frisell and Leisz were at the Lobero just a few months ago performing material from Frisell’s Guitar in the Space Age! album. It’s been a long time since I’ve been lucky enough to hear two guitar players with so much to say to one another, and to us. These guys can take you back to Duane Allman and Dickey Betts one minute, and forward to wherever music might be going in the future the next. In support of Lloyd, they were everything one would hope for to make a perfect homecoming for our area’s most distinguished instrumentalist.